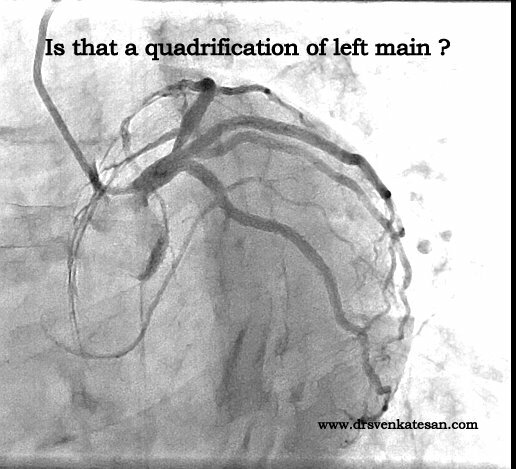 Is quadrification of left main possible ? Life cycle of PTCA : Let us hope it do not become extinct ! Does PTCA , a great Innovation for mankind, is facing a threat of extinction ? What drives the extensive research in biodegradable stents now ? The simple answer is , we are fed up with the metals inside the coronary artery. We want to get rid of it ! Too much of knowledge , often blunts our senses . Our track record clearly reveals this fact. We needed a major study INTERHEART to tell the world that ,exercise is good and tobacco is bad for heart ! Now ,we forgot a simplest solution for getting rid of metal inside the coronary artery , which is “not to implant the stent” at all ! (Instead we do billion dollar research for making bio – absorbable stents , which in the first place may not be required in the majority ! The only situation , where PCI may withstand the test of time could be in ACS (Both in STEMI and high risk NSTEMI !) 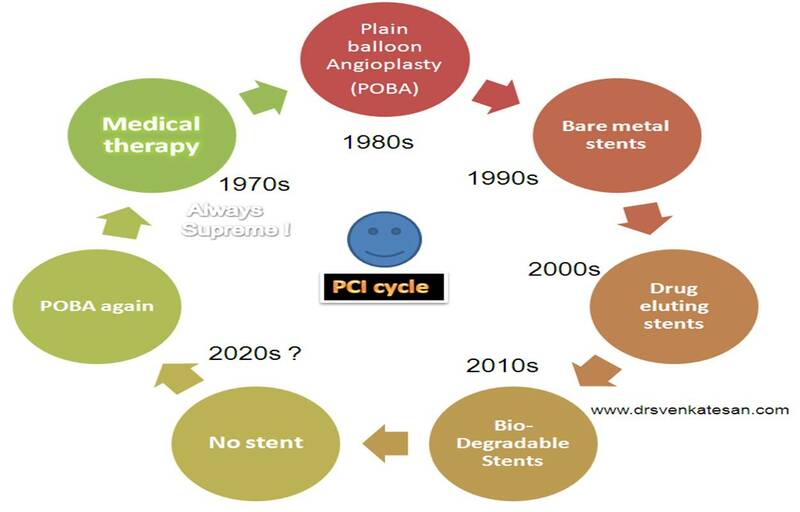 PCI is cosmetic in most of the chronic coronary syndromes . Our fight against human atherosclerosis will have to be , by medical means .PCI at best will provide a supportive role in selected patient group. It requires lots of common sense and scientific ignorance to achieve this. Risk reduction , prevention , optimal medical therapy will have to play a dominant role in the next few decades . This is something similar to the environmental issues we face in protecting our planet .No amount of green industry will protect the earth . It requires better social and behavioral ethics from mankind and their rulers ! 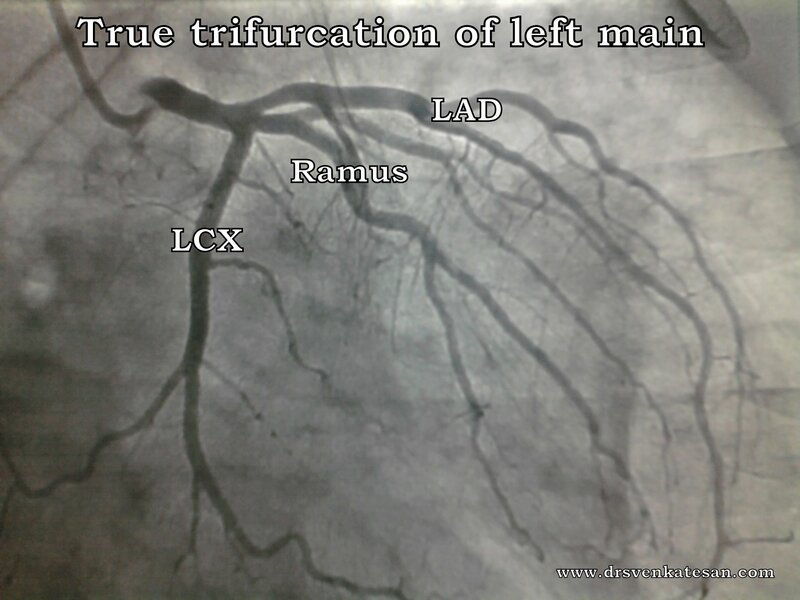 God blesses a few , with a trifurcation of their left main coronary artery ! God creates life with infinite variation . The heart gets bulk of its blood supply from the left coronary artery , which divides into two after a short course. Bifurcation is the rule . Left main becomes left circumflex and LAD in about in 85-90 %. Few men and women are blessed with three branches from LCA . The anatomical and physiological importance of this branching pattern is not well analysed in the literature .There could be few advantages of having a trifurcation instead of bifurcation . 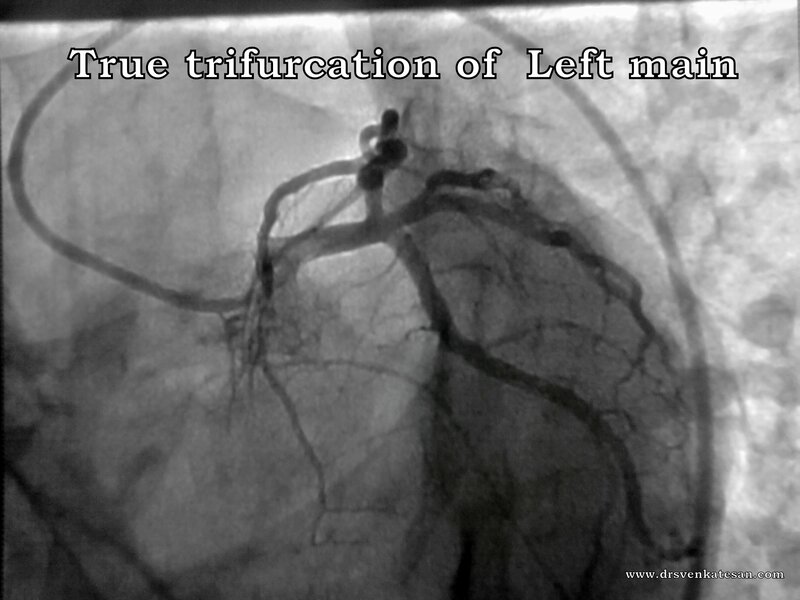 Left main impedence is less in trifurcation . This is due to the fact , left main empties into three distinct ostia rather than two.The combined cross sectional area of these three ostia confers a hydrodyamic advantage. The importance of any proximal LAD lesion in these patients , is negated by 33 % as two other vessels are there to take care the rest of the heart. A large Ramus usually supplies a vast area in the angle between LAD and LCX. This has a potential to protect against ventricular fibrillation during acute occlusion of LAD by providing electrical stability . It is also a fact , people with a large Ramus may have a trade off by having a diminutive diagonal or OM . * A related blog elsewhere in my site . The explanations offered above are based on personal observation . A simple solution from Canada , for all those complex Echocardiography formulas ! What is “Partially successful” or “Partially failed” thrombolysis ? Nothing in this world is black and white. In fact, most events are in between . The irony is , our brain always wants to view things in two distinct entities ! So it is no surprise ! cardiologists also travel in the same boat ! They classified the events after thrombolysis into two dogmatic categories . Successful thrombolysis or failed thrombolysis . . . as if no other event can occur in between . Traditionally 50% regression of ST segment is called successful . What about 30% and 40 % ST regression ? Further , there is an important caveat in the timing, as we traditionally assess , 90 minutes of thrombolysis . Thrombolysis is failed at 90 minutes, but succeeds at 120/180 minutes ? Is 50 % ST regression at 180 minutes is as bad or as good as 25 % regression at 90 minutes ? So, without finding answers to some critical questions , we have defined the success of thrombolysis with half baked data . This is exactly , is the reason we are unable to do a valid study on failed thrombolysis, rescue PCI etc . We know the results of rescue PCI , always been contradictory to the general logic ! It is estimated a substantial number of STEMI patients following thrombolysis fall into a category of partially successful thrombolysis implying partial restoration of blood flow and salvage. The correct definition for successful thrombolysis and reperfusion should be at the myocardial mass level , and not at the level of coronary artery.The ECG is the best available indicator. Hundreds of cardiology man hours can be saved for better purposes . Classifying thrombolyis into success or failure is a skewed way of looking at this important issue . It is an irony , cardiologists often triage LV dysfunction , valve disease , cardiac failure etc into 4 grades ( minimal , mild , moderate or severe ) . It is still a mystery , why thrombolysis is never graded like that , and it is always considered as all or none phenomenon ! There is a substantial number of patients with partially successful ( or shall we call partially failed !) thrombolyis .This group must be given adequate attention or inattention . There is a urgent need for a through review of how we look at the post thrombolysis status . It is better to use the newer imaging modalities like PET/MRI more liberally to identify exact sub group of failed thrombolysis who will benefit form revascularisation . Is it not , boring to see normal coronary arteries every day ! There need to be surprises in cath lab to make our time lively and keep our brain alert . Have a look at this angiogram in RAO caudal view.One of our junior cardiology fellows thought it was a split left main artery . 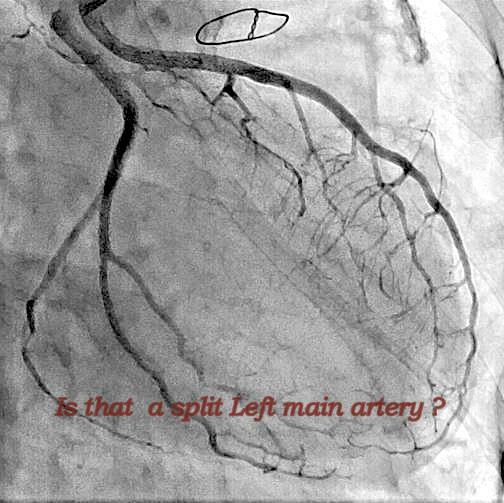 How can an artery split . . .of course the image indeed looks like that ! It was indeed an absent left main. Also called as separate origin of LAD and RCA. Note : There can be three types of absent left main. * Some books mention about a left main of 0 -5mm . Zero mm left main is nothing but single ostial origin of both LAD and LCX. A very short left main , say 1 0r 2 mm will practically mimic an absent left main. Here is the the dynamic angio image. It is surprising how a catheter in left sinus is able to visualise the LCX from right sinus so well ! Note the separate origin of LAD and LCX.The LCX was originating near the right sinus.It is intriguing to note even though they originate in different sinuses , the main stem of LAD and LCX wants to maintain a close parallel relation. Advantages of having absent left main . Sudden death is presumed to be less common in this population. Guiding catheter selection and positioning could be difficult. For all those proud heart patients . . . here is a heart repair manual ! Manuals are not only for doctors . There are few heart maintenance manuals for patients as well. This one from Philadelphia , is worth reading and of-course following thereafter ! Some books can be as effective as CABG or PCI . This one is definitely in that league . . .